Local taxi companies say they are facing a poor business environment even with the departure of ride-hailing company Uber from Myanmar earlier this year, leaving competitor Grab to dominate the local market. Before Uber and Grab started operating in Myanmar, taxi services were largely provided by two local companies: Hello Cabs and Oway Ride. But four months ago, Hello Cabs cancelled its taxi app because it could not compete with Grab. In fact, local taxi operators have been asking the government to set regulations to help save local businesses, as they are no match for the likes of Grab. “Right now, Grab dominates the taxi market and we can›t compete. Local taxi companies started long before the rise of the internet in Myanmar and when the international operators entered the market, they monopolised it by offering promotions and incentives to customers,» said U Aung Win, managing director of Dagon Logistics Co Ltd, the company that runs Hello Cabs. Under the country’s current regulatory landscape, no person or business is allowed to monopolise a market by selling goods at prices lower than cost. However, the regulations do not cover the provision of services. “We have competition laws that were enacted in 2015 but as far as I know the regulations and enforcement under those laws have not yet been fully fleshed out. We made a presentation to the president last year about how the government should step in and take action as local taxi businesses are suffering from what amounts to capital dumping, but nothing has come of it yet,» said U Aung Win. Capital dumping is when an organisation sells its products or services at a price lower than the price charged in its home market or below the cost of production. It is a kind of predatory pricing to increase the market share initially and charge nominally higher later on. Compounding the situation is the fact that local taxi operators can’t object too strenuously for fear of antagonising the public, who have come to rely on ride-hailing services. “Frankly, we can’t compete against the foreign companies. If we asked the government to take action, the public might say, ‘If you can’t compete, please move out of the market’, because customers are being given what they want,” he added. In any case, any action would have to come from a competition commission which has yet to officially take shape. “In my opinion, the government shouldn’t wait and see on this situation. Foreign companies are killing local competitors by giving many incentives to customers. In that kind of situation, the government should protect us from stronger entities,” said U Aung Win. As part of its efforts to compete, Oway Ride began offering three-wheeled taxi services in Mandalay called mini Oway last year. The service has proven to be popular and Oway Ride is one of the leading taxi companies in Mandalay. However, the company’s market share in Yangon is still negligible. 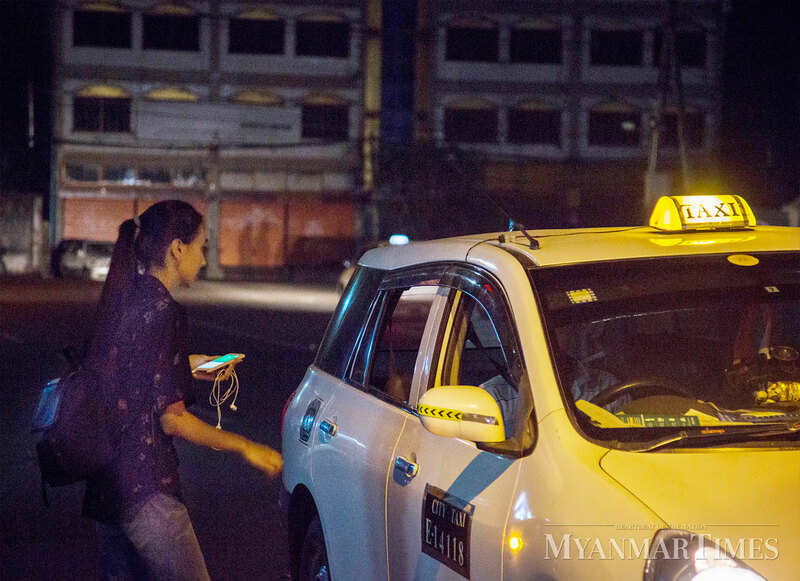 “We would like to grow in Yangon’s taxi market, but in reality, Grab still dominates that market. 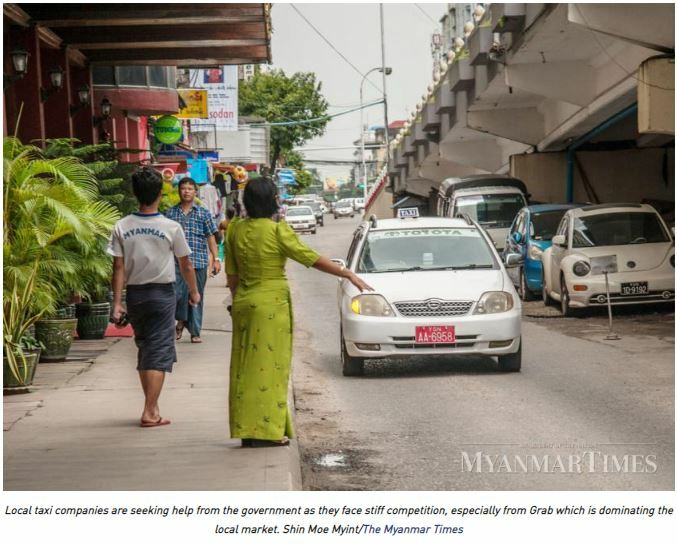 We are trying to boost Oway taxies with new and modern applications suitable for the local market, but we would also like the government to help support local companies,” said U Kyaw Min Swe, senior director and head of Oway Ride. “If competition regulations are not enforced the company or business with the most money will win and monopolise in the market. The government invited international companies without considering the consequences. Now, some local taxi companies are already dead and the government has done nothing about it,” said U Kyaw Min Swe. Grab and Uber entered the local taxi market just last year, but this April, Uber sold its business in Southeast Asia to Grab for a 27.5 percent stake in Grab. Singapore’s competition watchdog fined Grab and Uber S$6.42 million (K7.2 billion) and S$6.58 million, respectively, for what it deemed an ‘anti-competitive’ deal. “Myanmar has done nothing for the taxi business yet and I do not understand. The government should consider supporting other ride hailing companies and taxi companies so that the local market is not dominated by just one company,” said U Kyaw Min Swe. Oway Ride, Hello Cabs and other companies such as Ok Taxi and Billion Taxi Group set up their own apps but none have proven as popular as Grab so far. “Grab is very strong financially and they can afford to make a loss for a longer time in order to gain market share. Many countries have policies under which companies can’t do business by price cutting to gain a monopoly and Singapore fined Grab under that policy,” said U Aung Win. Meanwhile, some Grab drivers say they are working for the company because they have little choice. “The number of Grab users is rising because Grab is successful under the current situation. I also signed up as a driver for Billion Taxi’s app, but hardly any passengers use it,” said a Grab driver who declined to be named. “I also joined the Ok Taxi app, but I never met a passenger who connected with me with the Ok app, so eventually I stopped using it,” said another taxi driver. “They (Grab) can do what they wish as no rival can match them,” said another Grab driver. Still, Ok, Billion and other taxi apps are starting to gain traction and some drivers and passengers feel that the companies need to advertise more. Ok Taxi, which launched its taxi app in July, said it is not collecting service charges from drivers and it will get its profit from advertising. A higher number of options will beneficial from the point of view of customers as there aren’t many ride-hailing apps to choose from beyond Grab. Some have complained about the services of Grab drivers, but more are worried about the safety of ordinary taxies, especially following several news reports of taxi drivers killing passengers this year. “Under the current situation, we have to think about our safety. So, while we are not always satisfied to use Grab we have no choice and it is better than other mobile apps. I have tried other taxi apps but I had to wait a long time and it was inconvenient for me,” said Ma Nway Nway Aung from Therketa Township. “Mostly I don’t like the service of Grab taxi drivers and I used to argue with them about things like turning on the air-conditioning. And sometimes they don’t want to pick me up because they are far from me and then ask where my destination is. If the destination is a little far, they don’t want to go there but they never cancel the booking from their side in order to keep their driver rating high,” said Ko Aung Myin from South Okkalapa Township. Another common complaint about the app among both drivers and passengers is the accuracy of locations shown in the app. “These days the government and businesses are busy chasing foreign investment, but more should be done to also protect local businesses. In my opinion, if nothing is done Grab will dominate the market and this will discourage other companies from exploring the country’s taxi market, which isn’t very big,” said U Aung Win.